As we approached this coastal city across a series of causeways and bridges, darkness was falling and the flooding was already beginning, with frothing waves eating at the road. At one point our car was blown sideways across several lanes by the force of the wind, and every few minutes a bolt of lightning would illuminate the sky with an eerie green flash. By the time the eye of the storm was making landfall just 30 miles up the coast we were hunkered down inside a hotel, listening to the noise of screeching wind punctuated by the occasional crash. I watched from a doorway at the side of the hotel as the wall of a large metal building under construction came smashing to the ground. Thick palm trees have also been brought down and by the glow of street lamps and the flashes of lightning, you can see that the air is thick with driving spray. This storm is powerful, it is dangerous and it is terrifying. 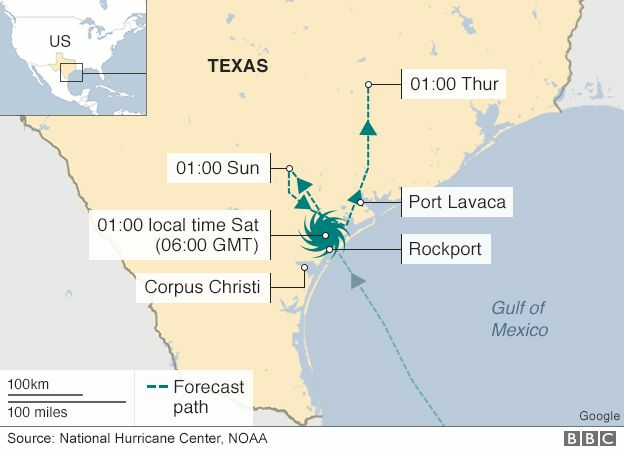 When Harvey struck close to Corpus Christi, around 22:00 local time on Friday (03:00 GMT Saturday), it had winds of up to 130mph. Trees came down in the city and power supplies were cut, but thousands of residents had heeded warnings and boarded up their homes before fleeing. When the storm struck again near Rockport, wind speeds had fallen slightly to 125mph. 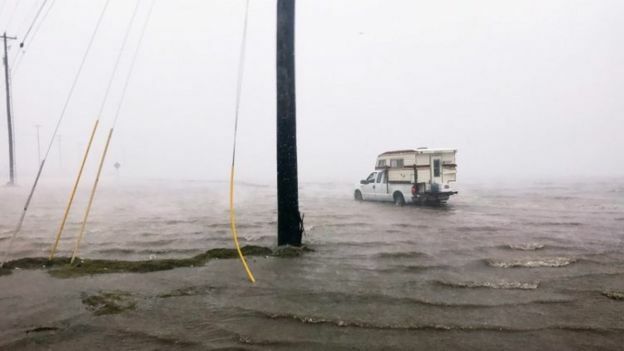 “Right now we’re still hunkered down and can’t go anywhere,” Steve Sims, Rockport’s volunteer fire chief, was quoted as saying by Reuters news agency. Rockport Mayor Patrick Rios said people were trapped in a housing centre for elderly people, where the roof had collapsed and rescue teams were unable to gain access, according to CBS. 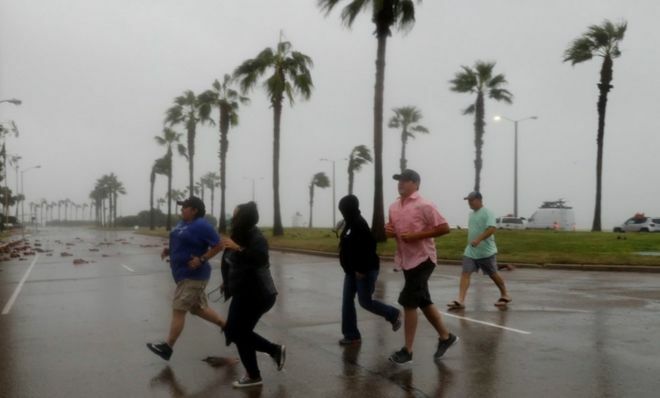 At 05:00 local time, the National Hurricane Center announced in a bulletin that winds had fallen to 90mph, thereby making the storm a category one. Speaking from Corpus Christi, city resident Michael Hunter told the BBC what he could see: “Our house has been boarded up, so the only windows I can see out of would be the front. Long queues of traffic have been heading out of the storm’s path. 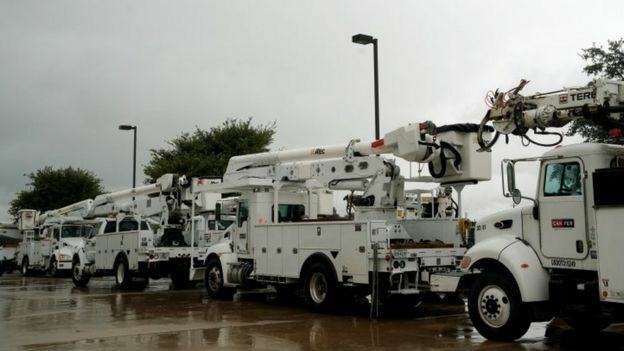 Governor Abbot said it was obvious Texas was confronting a “very major disaster”, and more than 1,000 National Guardsmen were to help with the disaster relief operation. Harvey is the first major storm of the Atlantic hurricane season. It is forecast to meander across south-east Texas until Wednesday. The NHC has stressed the danger of life-threatening floods as rising water moves inland from the coastline. Oil-rich Houston, the fourth biggest city in the US, could face up to 20in of rain over the coming days. Mr Trump is likely to visit Texas early next week, the White House said. The storm is the strongest to hit the US since Charley in August 2004. Harvey has severely hampered Gulf of Mexico oil production and air travel. About 45% of US oil refining takes place on the Gulf of Mexico coast, and Corpus Christi is an important port for the industry. Crude oil production has slowed by about 20% to prepare for the storm, and fears Harvey could lead to a shortfall in fuel have helped drive up prices.